Complete with a harness, lanyard and premium bag, our 2 point scaffold harness kit is ideal for ensuring the user can work safely at height and also stay comfortable at all times. 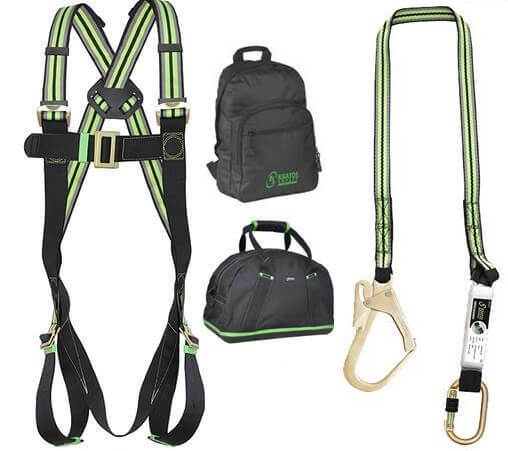 The universal harness of the 2 point scaffold harness kit comes with a D-ring attachment on both the chest and the rear, allowing it to stop a potentially life-threatening fall from occurring when properly used. The length of the shoulder and thigh straps can be altered to make sure the fit is snug and comfortable, while a sit strap provides support lower down to take the strain of the user’s legs and back. The 1.8 metre lanyard comes with 35mm webbing that soaks up sudden shocks, while extra webbing around the loops makes it more resilient and less likely to succumb to wear and tear. An alloy scaffold hook and karabiner sit at either end of the lanyard for complete peace of mind. We sell a number of height safety kits of various sizes and specifications. For cost-effective safety, our single point scaffolding kit is an excellent choice. For extra comfort and sturdiness, our 2 point premium kit is a serious contender for your attention. Whether you need details about the specifications of our 2 point scaffold kit, or are looking for a quote for a bulk order, get in touch with Rope Services Direct for a fast, friendly response. Our phone number is 01384 78004 or you can email us using our site. 2 Point Scaffold Harness Kit Overall rating: 5 out of 5 based on 6 reviews.